I think there are two kinds of people that like a smoked turkey. Those that want an already cooked turkey and those that genuinely like the smokey flavor. Ok It may be possible to be both of those kinds of people at the same time. If a smoked turkey is on your menu this Thanksgiving (or whenever you are reading this), the biggest turkey question has nothing to do with whether to brine or not, but how to reheat it. And reheating is what we are concerned with, not cooking. A smoked turkey comes fully cooked. I haven’t seen one in the store that hasn’t been. Let’s take some time and look at what it takes to reheat a smoked turkey. 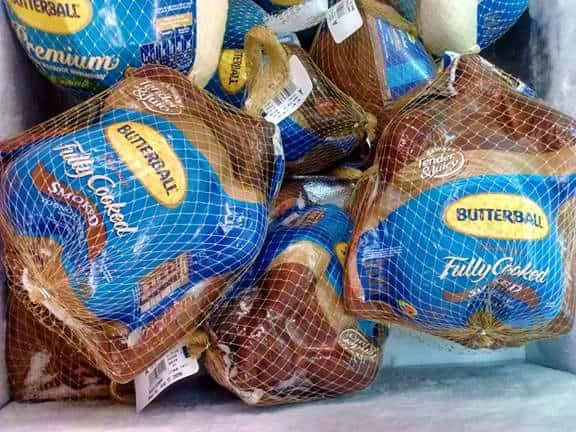 Is Your Turkey Fresh or Frozen? This is the first question we gotta deal with. I do see both in stores (the ones at ALDI were frozen, the ones at Costco were fresh). If yours is fresh, we can just move on to the next question. But if frozen, your going to have to thaw that bad boy. If you find yourself close to Thanksgiving with a frozen turkey still, check out my methods for a quick turkey thaw. They apply to any frozen turkey, smoked or not. Don’t forget to include time to defrost your smoked turkey if you bought it frozen. What is the Best Oven Temperature to Reheat a Smoked Turkey? Your best option is to go low and slow. You want the turkey to reheat as evenly as possible. Too high an oven temperature and you will dry out the external part of the turkey before the inside is warm enough. I think the process is not different than reheating a cooked ham. I suggest doing it at 250 degrees. If you are really in a rush, maybe up to 325, but really no higher than that or you could dry out the turkey. This is a case of your patience rewarding you. 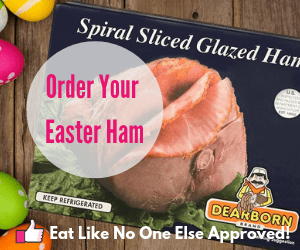 A slow reheating process is the best way to be sure you don’t end up with dry meat. What Internal Temperatures Does a Smoked Turkey Need to Be? When cooking a turkey I always go to 165 degrees in the deepest part of the breast without touching any bones. However, already cooked smokey turkey doesn’t need to get to 165. It just needs to get to the point of being out of the so-called danger zone. This is the temperature range that dangerous bacteria like to grow. Your chances of getting sick increase if your food is in this danger zone too long. The range is from 40-140 degrees. This is why you need your fridge to be 40 and under at all times. In this case we are concerned about the other end. Cooking your smoked turkey to 140 degrees will get it out of the danger zone. Some people may say to reheat it all the way back to 165. There is debate about this with camps saying 140 and some saying 165. I personally feel comfortable just going out of the danger zone at 140. But if you are feeling a little nervous about that, then go to 165. I don’t want you to have dry meat but I am more concerned about you feeling comfortable with the food you are eating. How Long Does It Take to Reheat a Smoked Turkey? This depends on so many things, I really can’t give you a perfect answer. Depends on the size of turkey and the temperature of your oven you chose. If you go the lowest temperature I would say around 4 hours or so. If you do it at 325, maybe 2 1/2 hours. Again there are too many variables to nail down an exact time as much as I would like for you. 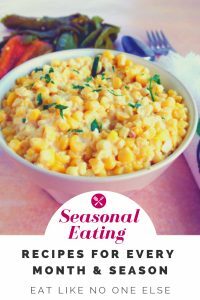 I would start it early enough to make your meal time and you could always keep it in the oven on warm for a spell. You will want to give it a 30 minute rest time before you carve just to like a regular turkey. This helps allows the juices in the turkey to be re-distributed. To give yourself a leg up, remove the turkey from the fridge for an hour before hand to bring up the temperature. Don’t worry that’s not too long for it to be out of refrigeration. I recommend having a probe thermometer on hand that you can place in the turkey and have a read out that sits outside the oven, so you can monitor what’s going on inside. Keep the turkey covered in foil for reheating to help keep the turkey from drying out. Color of the meat may look pinkish or reddish. That’s natural with a smoked turkey, it is not under cooked. To keep the turkey from drying out in the oven cover it completely in foil. For a crispier skin you can remove the foil near the end of cooking. I haven’t done this, but you could try re-heating it in a slow cooker. Although I think that would take too long to get to temperature, so I am not recommending it. If you are going to take the time to reheat a smoked turkey, why not just smoke the turkey yourself. Smoking your own turkey is not as hard as it may seem. 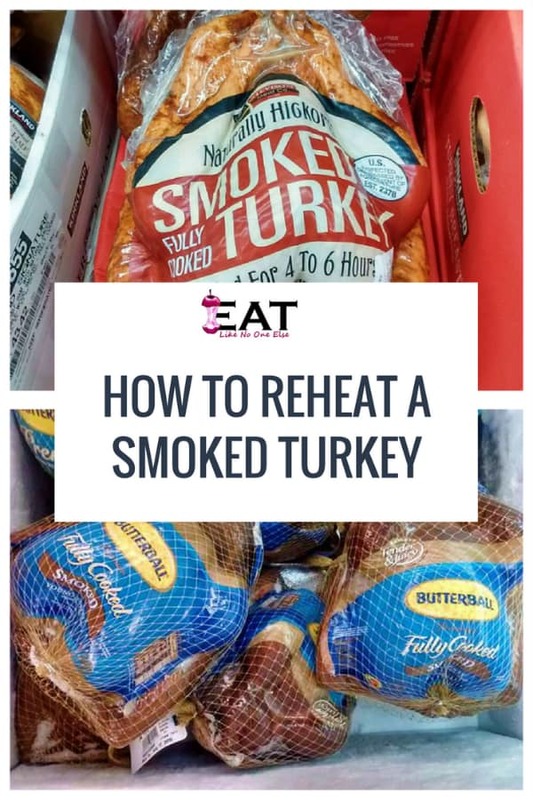 If you buy a frozen smoked turkey, the time you spend thawing it and then reheating it, won’t be much different then if you smoked a fresh turkey yourself. My pal Jack over at BroBBQ has great tips on smokers as well as grills. Check out his tips on choosing the best smoker, so you can be ready to smoke your own turkey the next time Thanksgiving comes around. Are you planning on a smoked turkey this year? 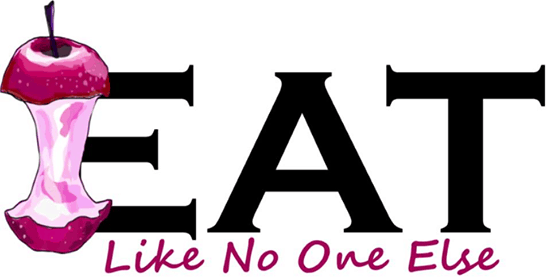 Leave a comment below telling us how you plan to cook/reheat it. can I cooked / heat a fully cooked smoked turkey breast in a pressure cooker? Is it ok to eat smoked turkey cold?? My turkey is smoked but it is frozen and today is Thanksgiving. 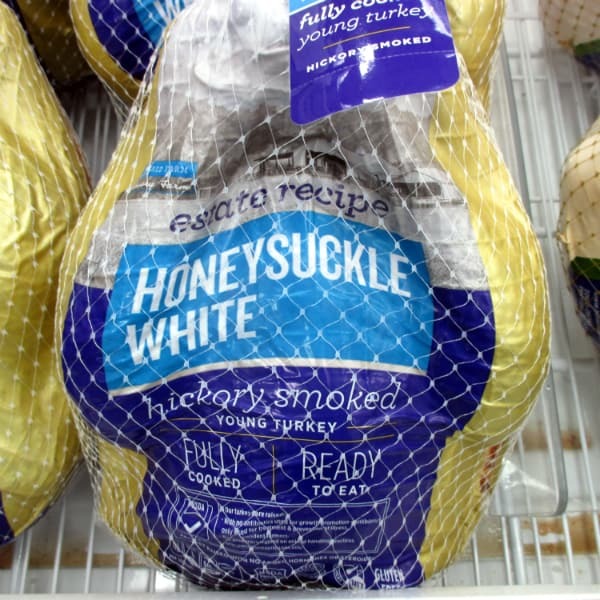 How can I warm the Frozen smoked turkey? 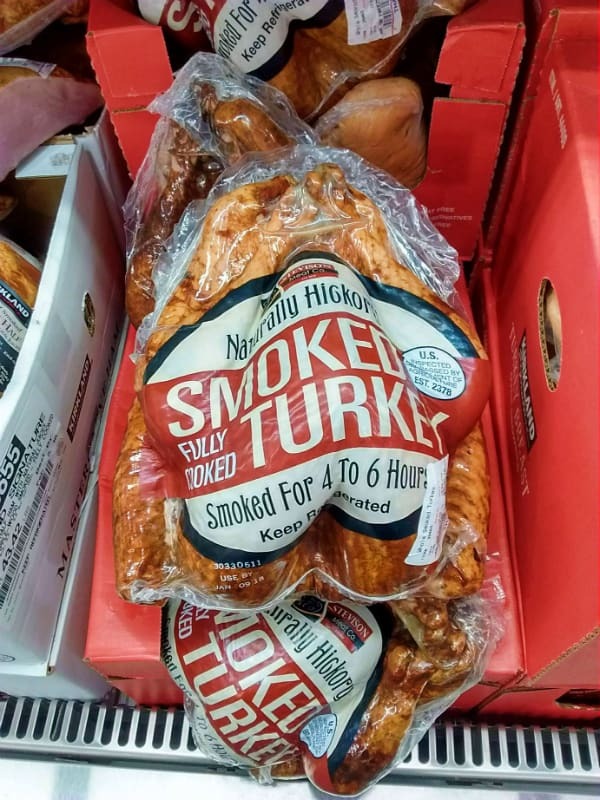 I bought two smoked, fully cooked turkeys a week after Thanksgiving–to be served at Christmas. The birds are labled, “Use by Jan 1, 2019.” They have been refrigerated for three weeks. I’m a little nervous though about how long they have been refrigerated (not frozen) Am I ok to serve them to my guests Dec. 25? If it was me I would have no problem cooking them since it’s still before the use by date, which in general are conservative. Was it ever frozen? Follow the same method, it’s just going to take longer. If you can at least try to defrost it somewhat before your meal that would be good. Put it in a 5 gallon bucket with ice to keep the temperature of the water out of the danger zone (below 40 degrees). As long as it says that it has been fully cooked.